Amazon Prime Day 2018 is coming up quick. Now in its fourth consecutive year, the annual super sale promises to be the commerce event of the summer. 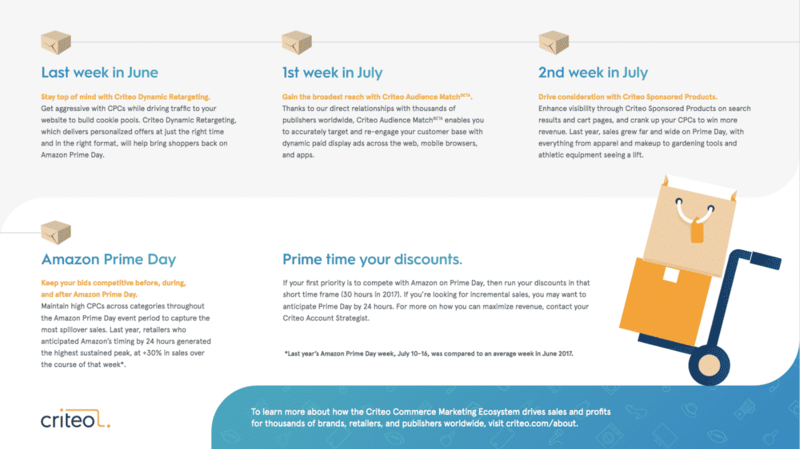 We dove into our data here at Criteo and found that there’s a significant “halo effect” during Amazon Prime Day, too – which means retailers should build a serious marketing campaign just before the holiday kicks off. What (and when) is Amazon Prime Day? Designed to promote Amazon’s subscription service, Amazon Prime Day is the annual promotional period when the retailer slashes prices on thousands of items, offering rock-bottom deals exclusively to its Prime members. Amazon Prime Day 2017 started the night of Monday, July 10, at 9pm ET and lasted 30 hours. 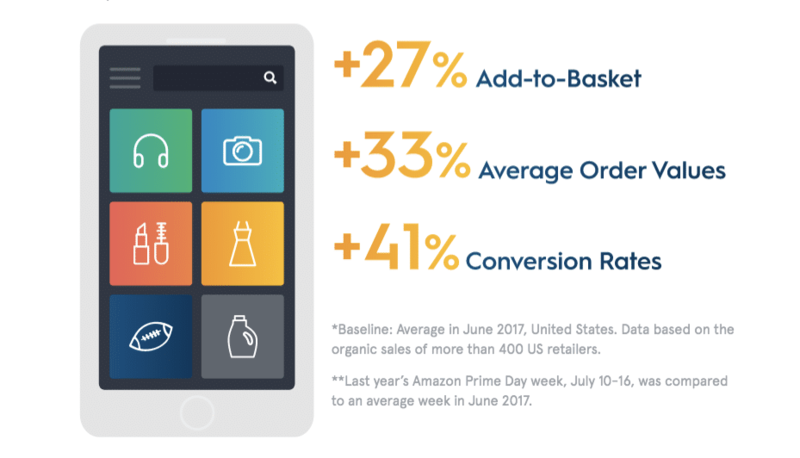 Compared to Prime Day 2016, sales grew by 60%, with tens of millions of shoppers making purchases. Prime Day 2018 is expected to be bigger than ever before. Amazon hasn’t yet announced the date, but the last two fell on July 12 and July 10. If the retailer follows the same pattern, this year’s Prime Day will fall on or around Tuesday, July 9, 2018. Amazon Prime Day boosts sales for everyone*. The halo effect of Amazon Prime Day is bright. We took a look at an average week of sales in June 2017 and compared it to the week of Amazon Prime last year. Then we analyzed each category across our retailer data. We found that there was an average sales increase of 57% in multiple categories, from fashion and health/beauty to home improvement and sporting goods. Retailers that ignored Amazon Prime Day and didn’t discount during the week saw the lowest bump in sales, at an increase of 5%. Retailers that followed Amazon’s timing and discounted during Prime Week saw the highest peak on Prime Day itself, and generated an increase of 25% in sales. Retailers that anticipated Amazon’s timing by discounting generated the highest sustained peak, at an increase of 30% in sales over the course of that week. Retailers that anticipate Amazon Prime Day within 24 hours benefit the most. Minimizing discounting before the big event will maximize your ability to compete with Amazon on Prime Day. There’s no denying that this is a big opportunity for retailers. As Amazon Prime Day becomes an anticipated holiday each year, we can see that similar holiday shopping behaviors start to develop among shoppers. By creating strategic campaigns during the same time, it’s clear that every company can benefit from the bump. For a deeper dive into Prime Day 2017, and what to expect for Prime Day 2018, download our Amazon Prime Day Guide and our Amazon Prime Day Timeline. *Baseline: Average in June 2017, United States. Data based on the organic sales of more than 400 US retailers. **Last year’s Amazon Prime Day week, July 10-16, was compared to an average week in June 2017. To learn about how to connect with the next generations of influential shoppers, download our Gen Z report.